Regardless of your political views, you have to admit that Bill Clinton did some good. He's solved a thorny problem in helping to liberate the two American journalists who either strayed into North Korean territory by mistake or were seized in China by border guards. The man has it. Charm in bucket loads. I guess our best attributes can often prove to be our worst attributes. Bill's success has got me thinking. Granted, a little more laterally than I possibly should be before my evening glass of wine, but bear with me. I am now wondering why Governments don't use 'really special people' as magic bullets to solve the world's problems. And by "really special people", I don't mean ex Presidents. I mean white collar psychopaths. You know the human predators who look less like Charles Manson and more like Bernie Madoff. Bernie seemed trustworthy enough. However, he single handedly changed the lives of hundreds of thousands of people in an extremely evil way. He is grandiose, exploitative, arrogant, charming, callous, immoral, superficial, deceitful, non emotional and manipulative. Just the qualities needed to become a special international troubleshooter in some far flung terrorist haven. Personally, I cannot see the point of Bernie languishing in gaol for the rest of his days loitering around the prison library or taking woodwork classes. Why doesn't the American Government make him earn his keep and truly pay for his crimes? He is a Master Manipulator who must have an incredible mind. Could his 'skills' be used for good instead of evil? Send him to the Middle East. China. Korea. Afghanistan. Better still, drop him in the remote mountains of Pakistan with enough food for 30 days and let him use those incredible powers of persuasion to find Osama bin Laden's cave (if he is alive, Bernie will 'con' someone to get the facts I am sure and persuade OBL to show his face). What's the risk? It takes a sociopath to understand how the minds of other sociopaths work. They can be used as freelancers to deflect or solve crises. If we lose a few of them, in the more remote parts of the world, so be it. OK, it may be too much of a risk having pathologically disordered folks flying the flag (then again we've had them running countries), but I think it's worth one of those ROI government trials at least. On another note I had to show you a few photos my nieces took of my favourite city in the world, New York. I am so tempted to sign up for BlogHer 10 just because of next years venue. Anyway, I was downloading the images and all was going well until the final one popped up. WTF? Does anyone recognise this part of the New York landscape? I am not sure if its the Bald American Eagle or whether the light on this gentleman's bald sport blinded the little photographers while they were taking a photo of another landmark. If you live in New York and recognise this 'bald landscape' let me know. Bill has always done very well with foreign relations. People do love him. Interesting idea on the psychopaths... makes sense. hehehe. and the bald guy? hmmm... was he a cab driver? I am ready to co-sign your letter to Obama, Lilly. Your reasoning is very logical. Sending Madoff to the remote mountains of Pakistan rather than imprisoning the 71 year old for 150 years makes much more sense. And then you made me smile with your "Bald American Eagle" gentleman. Also LOVE your new header for August. Great idea about Madoff! Something to think about. The "Bald American Eagle" is definitely NOT John. He doesn't have any hair! I bet it's just some fellow who was walking in front of her. I like her sense of humor though! LMAO at the 'new landscape' - I'll have to remember to take shots like that. Ah Bill.... he did us proud. Interesting that they specifically requested Clinton. Of course, this is generating a lot of talk in the "sensationalized" media in America. The media is drinking it up faster than your glass of wine. I have heard of balding the landscape and that must be what it means lol. Now that is a good idea where can we send a few corporate bankers as well. White collar criminals could do well negotiating with terrorists - at least they would be mixing with their own. It is a shame that these clearly intelligent gifted minds use it to hurt people as opposed save the world in some way. I fear its all a game and they get their kicks being Jekyll and Hyde personas. Sick creatures. I am just glad that it wasn't Jesse Jackson!! Living in Chicago we hear a lot about this man. While I am not a Bill Clinton fan, I will admit that he was a decent president, it is him personally that I am unsure about. I can say that he did a great job getting these two people released. And I am glad that he is able to represent the US in such positive ways. blowhard...a bad guy, but he'd make a good fixer." Hello Lilly, such interesting thoughts and proposals. And funny too. Email Obama, you'll hear from him. BRILLIANT idea...and it just might work....or Bernie would end up running some foreign country and causing more chaos. He is just slimey enough to survive and convince them he should be in charge. Loved the pictures of New York. I'll be there in a few weeks with my daughter...it's her first trip and I can't wait to show her the city. Minus the bald head hopefully. Great article Lilly. hope you enjoyed your time on the boat too. Have you ever seen the movie "Catch Me If You Can?" Leonardo diCaprio plays Frank Abagnale Jr. who was a conman that eventually worked for the CIA in exposing the cons of other wanted men! Great movie! It makes me wonder how many more criminals are used in ways to expose or trap others, that we may never know about? interesting chain of thought - Bill Clinton was put to good use. Some ex-presidents like Carter do better out of office. I don't expect anything from Dubya though. Maybe Bernie could start selling those GM cars, but some would rather see him under a GM bus. It's funny Bill Clinton made you think of Bernie Madoff. Misguided, talented people. LOVE the pics of NYC! Your nieces really saw the sights! And if YOU are going to BlogHer in NYC, I'd seriously think about going too! You know, that's not a bad idea - putting some misguided souls to work where they might actually do some good (or at least no worse!). ROFL on the bald pate. Love the idea of the human silver bullet! And I still love Bill Clinton. Hey Rhonda, It hink we should all go, what do you say? A year is a long time on one hadn to plan these things and who knows if we will all still be blogging by then but I am up for it I think! 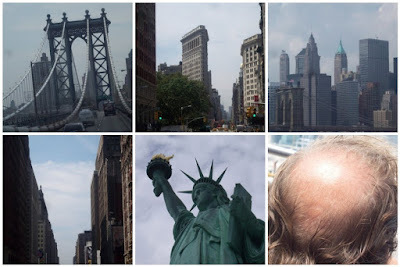 LOL, LOL....No, I am not familiar with that "bald" person as being a Landmark of NYC----My Hometown! But I love that your little bieces took these very mysterious pictures of that great city. As to Bill Clinton....He was the perfect person to handle the final arrangements of this delicate situation.....He WAS the President of our country and had and still has pretty good Foreign relations skills---much much better than Mr. Bush & Company who have alienated so very many with their lack of skills and their need for 'control' over everyone and everything for their own personal gains. Frankly, I believe someone like President Clinton will hopefully be used more in these Foreign reations situations.....He has natural gifts in the area of people skills and diplomacy, and he is very well liked in many quarters. At this point in time with all of the serious problems we have, The United States should use any and all good people at our disposal to try to accomplish putting out all the many fires created by the former administration. And, in my opinion, Madoff should stay right where he is and has NO place in anything to do with diplomacy. I wouldn't trust him as far as I could throw my house. "Bernie ... He is grandiose, exploitative, arrogant, charming, callous, immoral, superficial, deceitful, non emotional and manipulative. Just the qualities needed to become a special international troubleshooter in some far flung terrorist haven." ...and the more successful politicians are different in what way? I was born in Brooklyn and grew up on Long Island. I live only two hours away from the greatest city on Earth. Lilly, you simply MUST come out next year! Oh, the fun we could have!!! Bill Clinton was a rock star, is a rock star, and will always be a rock star. And, what's something all rock stars have? GROUPIES! While on wacky ideas - wouldn't it be great if every city had unusual people as landmarks? Or tourist attractions? Hmmmm...food for thought there Lilly! I love those photos of New York! My number one dream destination! Have a lovely weekend! @ Sam - think about going to BlogHer next year - great networking for bloggers and you get to go to your drema destination....and meet all the rest of us.. I LOVE Bill Clinton and I LOVE the way you think. That is truly genius. And I really mean that I like the idea. The bald head looks like someone got in the way when a niece was trying to take a picture from the Empire State Building. That's my guess. Glad you like it Susan but will Obama - as someone rightly pointed out these Madoff types are so clever he would probably be leading Al Queda before we know it and have OBL on a leash...such a shame they are so twisted because gosh they could do some good if it was directed the right way. Bill C. is a charmer, and I'm glad he got the journalists back home. I love Bill Clinton but his charm is probably what got him into hot water in the end. I'm all for sending Madoff any where you can think of. Definitely.